Gov. 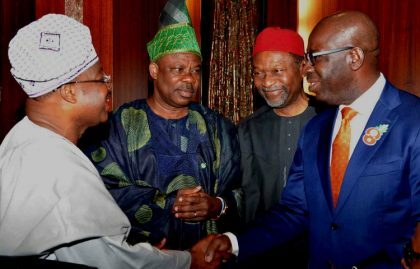 Godwin Obaseki of Edo and his Oyo State counterpart, Sen. Abiola Ajimobi, have given an assurance of peaceful state congresses of the All Progressives Congress across the country on Saturday. The governors spoke on Friday in an interview with journalists in Benin after attending the funeral mass for late Dr Christopher Abebe at Iruekpen, Esan West Local Government Area of the state. Obaseki said that the APC had laid a solid foundation in the reorganisation of the party in the state and pledged a hitch-free state congress. ” Our local government council election went smoothly and our APC ward congress went hitch- free. “The LGA congress held last week was also successful except for one or two issues which have been practically resolved. We don’t expect any issues tomorrow,’’ Obaseki said. He said that the party was committed to ensuring internal democracy, promising that delegates would vote for any candidate they feel would best represent their interests. Ajimobi, his Oyo State counterpart, said the foundation for development in his state was peace and security. The governor gave an assurance that the party in Oyo State was ready to conduct a peaceful state congress.